Starring: Jack Benny, Fred Alen, William Bendix. 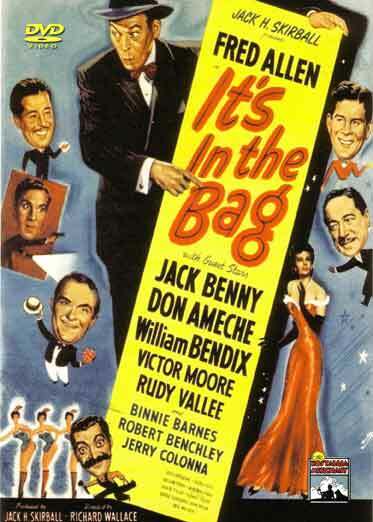 In It’s In The Bag, Fred F. Trumble Floogle, a flea-circus proprietor, learns that a wealthy relative has died and Fred is the heir to a fortune. He moves his family, wife Eve, 12-year-old son Homer and 18-year-old daughter Marion into a high-cost penthouse apartment. Later, they learn from a crooked attorney, Jefferson T. Pike, that the huge fortune has been dissipated and that all that remains are five chairs. These are sold to an antique dealer who sells them to different clients. Still later, a messenger arrives with a recording of the will, which informs Floogle that his relative was murdered by the man who had swindled him out of his $12 million fortune but that he had managed to salvage $300,000 in currency, which he had concealed in one of the chairs, along with the evidence to convict his killer. The search begins for the right chair. 1945 – BW – 87 Minutes. This entry was posted in Nostalgia Merchant. Bookmark the permalink.